The Queen’s granddaughter Zara Tindall and her husband Mike have sadly lost the baby they were expecting, just days before Christmas. 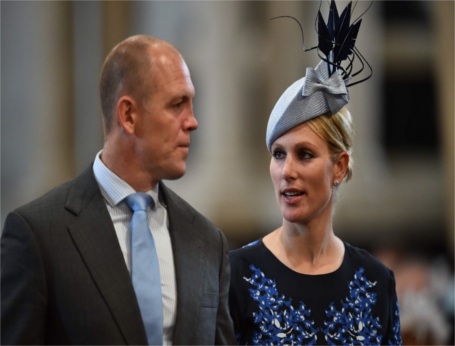 Equestrian champion Zara and former England rugby player Tindall revealed at the end of November that they were expecting their second child, saying they were "very, very happy" and looking forward to 2017. But on Saturday it was announced they had lost the baby. A spokeswoman for the couple said: "Very sadly, Zara and Mike Tindall have lost their baby. At this difficult time, we ask that everyone respects their privacy." Mrs Tindall, 35, whose daughter Mia is nearly three, was due to give birth in late spring. The spokeswoman would not give any details about the circumstances surrounding the loss of the couple's baby but it is understood Zara, who was four months pregnant when she miscarried, is not in any medical danger. Earlier this year Mrs Tindall missed out on a place in the GB equestrian team in Rio. The baby would have been the Queen’s sixth great-grandchild, and Her Majesty had said she was “delighted” at the news. A spokesman at Buckingham Palace declined to comment on a private matter. The couple had been expected to spend Christmas with the Queen at Sandringham. Messages of condolence were posted on social media within minutes of the news, with Gloucester Rugby Club tweeting: "The thoughts of everyone at Gloucester Rugby are with our former Club Captain Mike Tindall and wife Zara today. Truly awful news." The thoughts of everyone at Gloucester Rugby are with our former Club Captain Mike Tindall and wife Zara today. Truly awful news. "Just a quick one to say thank you for the messages. We are very very happy about the little one on its way. 2017 is already starting well!!" The Countess of Wessex lost her first baby in December 2001 when she was airlifted to hospital after suffering a potentially life-threatening ectopic pregnancy. She underwent a two-and-a-half-hour operation during which surgeons removed the foetus from her Fallopian tube. When eight months pregnant with her daughter, Lady Louise Windsor, two years later, she was rushed to hospital after complaining of severe internal pains. Doctors found Sophie dangerously ill from blood loss and performed an emergency Caesarean and her daughter was born prematurely weighing 4lb 9oz. The Tindalls live on the Princess Royal's Gatcombe Park country estate in Gloucestershire and Mrs Tindall was expected to have her child at her local NHS hospital, the Gloucestershire Royal Hospital, as she did when Mia was born in January 2014. It is likely that Zara will now spend Christmas convalescing with husband Mike and their daughter at Gatcombe Park. The baby would have been a second cousin to Prince George and Princess Charlotte, who call their great-grandmother the Queen "Gan Gan". Mrs Tindall is also one of George's godmothers. Earlier this year, Mia was pictured holding the Queen's famous black handbag when the monarch posed for an Annie Leibovitz photograph with her great-grandchildren to mark her 90th birthday. Mrs Tindall, daughter of the Princess Royal, missed out on the Rio Olympics after she failed to make the British Equestrian Federation's nominated rider list due to problems with her horse, High Kingdom. She last competed at the end of October, when the eventing season ended, but was not due to compete again until after her baby was born, as the season does not start again until March. During her first pregnancy she carried on riding until she was several months pregnant. A spokesman for Mrs Tindall said at the time of the announcement of her pregnancy that there were “no plans” for her retire from riding, meaning she was likely to be back in the saddle some time next year. The former world eventing champion helped the Great Britain team win a silver medal at London 2012 and had been hoping to bring back a gold from Brazil.